Surf News Network, March, 2015. Recent maintenance performed by the Pacific Islands Ocean Observing System in the UHM School for Ocean and Earth Sciences and Technology retrieved harmful gear from the Hilo Bay buoy. The gear was wrapped around the buoy’s mooring line. The agency did not specify what kind of gear it was, but urged ocean users to be careful of the very expensive piece of equipment. PacIOOS released a statment that in order to keep the buoy operational, ocean users are kindly asked to carefully navigate around the wave buoy, refrain from tying to the equipment, and avoid fishing within 600 yards to minimize entanglement in the mooring line. The buoy provides data about wave height, direction, period and sea surface temperature, and is located seven miles northeast of Hilo harbor. 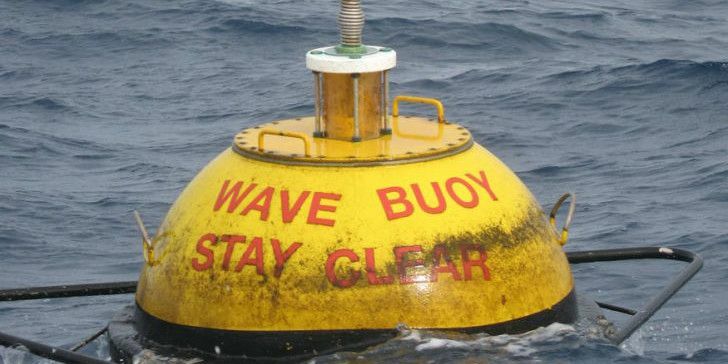 It’s part of a network of 13 real-time wave buoys across the Pacific.